One man’s front yard can be another man’s sugar bush providing you have a few maple trees on your property. 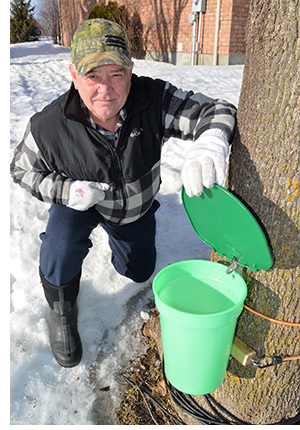 In the tiny village of Navan, just 10 minutes south of Orléans, self-avowed maple syrup lover Pierre Gravelle has been tapping the maple trees on his residential property for the past two years. He has four trees in all, which last year produced 400 litres of sap which he boiled down to 10 litres of golden maple syrup. “I retired last year so I figured why not? My son-in-law’s family has a sugar bush in Sarsfield and my wife and I really like maple syrup so I thought why not give it a try,” says Gravelle. Although Gravelle once worked as a technician for Spar Aerospace, making maple syrup is not exactly rocket science. All it takes is a spigot to tap into the tree and a bucket. Total cost – about $10. Oh, and you need a maple tree, or two, or three. The more the merrier, says Gravelle, who expanded his operation to include several trees on his son-in-law’s family property in Sarsfield this year. To process the sap, which has the consistency of sugar water, into syrup takes heat and a little patience. The heat source should preferably be outdoors. 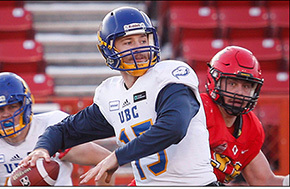 Gravelle found that out the hard way last year when he tried to process the sap on his stove. The vapour that’s produced when you boil the sap has a high sugar content and it can be very sticky. Gravelle now uses a large metal pot over a propane burner in his backyard. After tapping his trees over a week ago, he’s managed to produced 1.5 litres of syrup so far this season. Maple syrup production is extremely weather dependent. The optimal condi- tions require cool evenings combined with warm sunny days and very little wind. When the sap is running, it’s the consistency of sugar water. Some people simply boil it to remove any impurities and drink then drink it like water. Maple water as it’s called, is rich in nutrients and minerals including calcium, potassium, manganese and magnesium. But Gravelle warns it can also be a diurectic if you drink too much. The main advantage to making your own maple syrup is economic. A 540ml can of maple syrup can cost as much as $10. Depending on how often you use it, it can easily add up. Gravelle figures the 10 litres he made last year cost him about $40, but that’s because it was his first year using the spigots and buckets. His only cost this year will be the propane he’ll use to process the sap and the mason jars to store the syrup in. “It’s a nice hobby and we really like maple syrup, especially when you make it yourself,” Gravelle says with obvious pride. They are a number of sources on the Internet to help the a maple syrup lover makes his own product. The only thing that is absolutely necessary are the maple trees.